Plans for a new one-way traffic system in Edinburgh, to cope with the trams, have been postponed following business concerns. The council had proposed a 12-month pilot with traffic running in a single direction loop around the city centre. It has now delayed that decision until August after traders complained it would reduce footfall outside their stores. 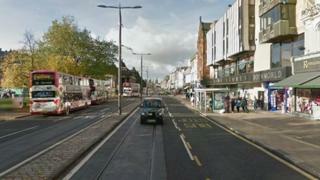 Trams are due to be running in Edinburgh by the summer of 2014. The project's final major piece of construction work - the installation of overhead and underground cabling for the city centre section - is under way and should be completed in August. A report due to be considered by the City of Edinburgh's transport and environment committee had recommended councillors agreed to proceed with a trial of the one-way system. The plan would see general traffic and buses travel in an eastbound direction on George Street, with the other side becoming a two-way cycling lane with space for pedestrians. On Princes Street, all buses, taxis and cycles would run in a westbound direction. The council has carried out a consultation and heard the views of stakeholders, including city centre businesses and traders. The report being considered by the transport committee said: "Respondents were sceptical about the benefits of introducing a one-way system to the city centre, particularly for buses, arguing that traffic would be displaced if no developments in alternative transport provision or better linkages between other parts of the city were provided. "Strong concerns about traffic displacement were made from residents of the New Town." Transport convener Cllr Lesley Hinds said: "The Building a Vision for the City Centre report came out later than I would have liked because the consultation only finished recently and there have obviously been a number of comments over the past few days. "In these circumstances, the City Centre working group wishes to continue the report to the next transport and environment committee. "This will give stakeholders a chance to look closely at the proposal over the summer and will also give us time to reflect on some of the issues that have been raised."